Not much fruit on the digging trees today, but what I did find made me happy. I realised that despite all the records I DO have here at the DAILY DIGGERS HQ, I didn't possess an original copy of "APACHE" by the INCREDIBLE BONGO BAND. Before you all begin to shout at your PC screen "What the EFF? But that's the godfather of all drum breaks, surely there is an OG copy in there somewhere?" I'm afraid not - but today I finally righted that massive wrong (believe me I haven't slept properly for years!) So all y'all beat diggers of the world please forgive my sins, I now have an original. It came cheap too without the original cover, which probably means I will end up buying yet another copy in the future, but the price was right as they say. And the vinyl is near mint so I definitely copped a bargain. Although I have a repress of this LP (did I just admit to that?) it sounded ten times better to blast the original. I don't know why, just call me stupid! And I never tire of hearing this record although it has been on constant rotation with deejays during 30 years of hip hop. Plus a funky little IKE AND TINA TURNER 45 also came home with me today - check the photo. Anyway, right now let's ALL get down to "APACHE" - king of the breaks without a "shadow" of a doubt (see what I did there?). MICHAEL VINER'S INCREDIBLE BONGO BAND - "Apache"
All about the Ike & Tina Turner 7" for me...Bold Soul Sister always seems to find it's way into my gig box! Cheers for the 'Apache' vids, very intersting. YO! whats up Fishly - been checking some of your vids on the Tube, some dope ish! Yeah Bold Soul Sister is a floor filler no doubt. ..and yes Pinky, I found it strange that King Errison was not aware what a cornerstone of hip hop Apache actually is. Dope Docu......I can't believe King Errison can't remember doing the IBB sessions....it should be top of his CV, tops anything he did under his own name. IMO "Bongolia" tops "Apache", at least on the speed front, for Errison's performance. Props also to Jim Gordon (RIP) who was the drummer on at least the first Incredible Bongo Band LP. This blog is truely what hip hop is about, cos of the breadth of knowledge dropped....AND essential digger's beats all round! Stu, cheers i wasn't aware of king errison's input on the IBB stuff! or Jim Gordon..ya learn somethin fresh everyday about this culture. Hey Kid Dyno,it's sunday morning I hit the Boot sale got the ol' fingers dusty and just got back to the crib with a load of old 45's + 2 Drum Drops albums by DAVID CRIGGER - apparently Hollywoods top session drummer in the 70's and who rocked the skins on the original HAWAII 5-O score and on CHIPS..still as yet to go check em out..is anyone familiar with the series cos ive never seen them before..slight snag that they are both fairly beaten-up copies..im hoping they are good finds and that kicks n' snares o'plenty.Fingers crossed! 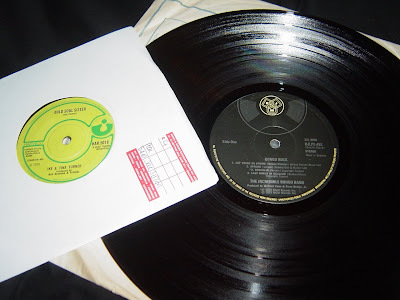 found a copy of CHERYL LYNN 'To Be Real' on 45 been looking for that one for a minute..
also, got me an OLYMPIC RUNNERS ' Put The Music Where Your Mouth Is'45..some band called HEADS, HANDS AND FEET 'Warming Up The Band'has a nice cowbell, drums and choppy guitar intro..not bad for the SP if I owned one that is..uhmm..also on the b-side there's a song called 'Silver Mine' with a nice drum break intro..not sure if this has been chopped?.. THE UNDISPUTED TRUTH 'UFO's' 45 for some cosmic funky biz..nice break at the intro that needs flippin'....BLACK GORILLA 'Funky Jungle'..dopeness is all im sayin!..and a disappointing 45 by a band called BLACK BLOOD 'A.I.E.' looks cool on sight but i will save you the same disappointment recommend you dont fall for it nothing special about this record; both sides..EASTSIDE CONNECTION 'Your So Right For Me' has a serious disco break at the intro..very very surprised by this one on the CREOLE label.P. Whilst flicking through a copy of Mojo recently, I came across an obituary for Michael Viner who died 8th August 2009 of cancer.